Welcome to the West Houston Shotokan Karate Club. We are an affiliate of the Shotokan Karate of America (SKA), a non-profit organization that has been teaching traditional karate-do since 1955. Currently, SKA has 140 dojos (practice halls) in the United States alone, as well as international affiliates around the world. 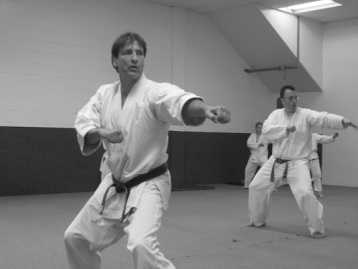 West Houston Shotokan traces its Houston roots to the 1970's, when Dan Sullivan and Doug Holford first started an SKA-affiliated karate group in Houston. Over the following years and decades, the Houston Shotokan dojo grew and was led by Don Edelman and Eddie Horton. Subsequently, Alex Shurin, who was a student of Mr. Holford, Mr. Edelman, and Mr. Horton, received a permission from Ohshima Sensei to open a West Houston dojo in 2002. Presently, practices are being led by George Canjar, a senior instructor who began karate training in 1978, at the Boulder, Colorado dojo, and Alex Shurin, who began training in 1990, in Houston, Texas. Both received their Black Belts from Tsutomu Ohshima. If you are interested in observing or participating in a class, please let us know by filling out a form below.